The Rev. 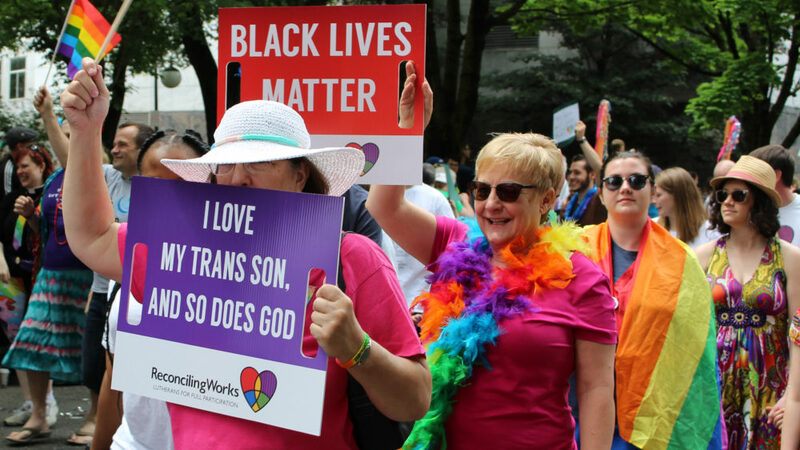 Tara Wilkins, Executive Director of the Community of Welcoming Congregations, kindly invited us to march as part of the CWC contingent, behind the Integrity banner and those of our own churches. So we will be a contingent-within-a-contingent. We are part of Contingent #72, which will form up at the corner of Glisan and NW 8th Avenue. Marchers are asked to arrive by 11:30 a.m., with step-off anticipated shortly before noon. Please plan to join us and help achieve a critical mass of Episcopalians. Char McCreight will be there with the Integrity banner sometime between 10 and 10:30. If you need to contact her, her phone number is 503-991-9510. Text may be better than the phone due to the noise. We are looking forward to seeing all of you Sunday…. as in past years, everyone is welcome; bring some friends, relatives, neighbors or co-workers. AND, don’t forget your church banners, make a sign and let’s celebrate PRIDE.